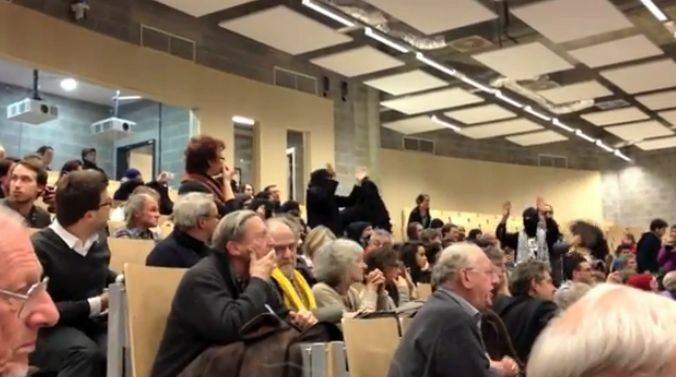 Yesterday ULB university organized a debate between French journalist Caroline Fourest and Hervé Hasquin on the extreme right. The debate was heckled by niqab-wearing activists who shouted "Burqa, bla bla bla" and accused Fourest of Islamophobia. The activists were mobilized by Souhail Chichah, an economics researcher and assistant at the university, who is known for his extremist views. The debate moderator, Guy Haarscher, urged him to come on stage to speak. According to Le Soir, Souhail Chichah had called for 'Burqa pride" on social networks, which was dedicated to the 'stoning of Caroline Fourest'. Fourest was forced to leave the room, escorted by security. She said she does not intend to return. Le Soir says UBL are outraged by this attack on freedom of expression, and that Souhail Chichah will have to stand before the disciplinary board.